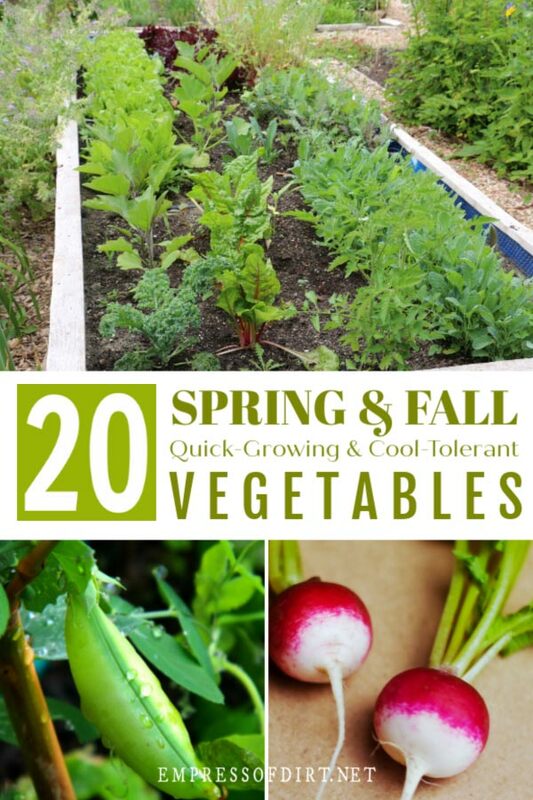 There are plenty of delicious veggies you can grow in the cooler months of spring and fall. This list features quick-growing options that are ready in just six weeks. Come see these leafy, green, delicious choices. For more fall garden tips, also see, 25 Flower Seeds to Sow in Fall and 20 Flowering Bulbs to Plant in Fall. If you have been here before you know I love cool weather gardening. 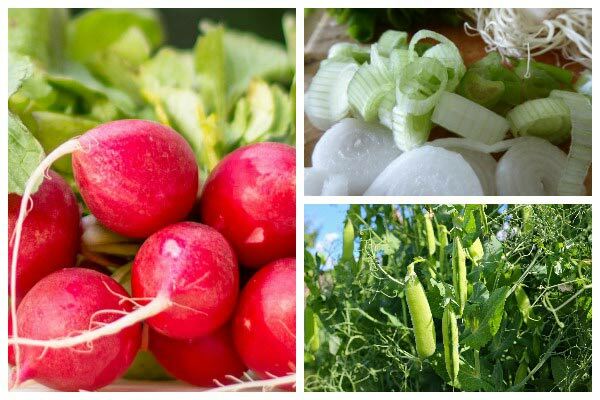 Free of the intense heat and humidity of summer, it’s a beautiful time to be outside and the conditions are ideal for many cool-loving veggies. Spring and fall are the time for growing nutrient-dense, leafy greens, and, if you have never been particularly fond of them, it is time to give them another try. I know we hear this all the time but it’s true: nothing compares to the flavour and juiciness of freshly-picked spinach and leafy greens! That limp, lifeless stuff in the grocery store shouldn’t even be sold as food! All the veggies on the list (below) have edible stalks and leaves which makes them ready to pick at any point in the growth cycle. The estimated harvest day is simply marks a point where growth may be at a maximum. Plus, many of these varieties are ‘cut and come again’, meaning, you can trim off leaves for your dinner salad, leaving an inch at the base, and new leaves will grow—sometimes several times over. Bonus! You can start sowing cool-tolerant crops when your garden soil temperature is consistently 50 to 68 °F | 10 to 20° C.
Have onions stored in your kitchen sprouted? See how to regrow them. 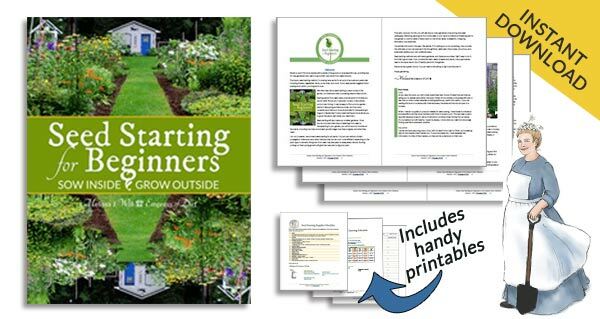 While this is probably not a concern for short-term veggie crops, if you are a beginner gardener, the first step is to know your gardening zone (for plant hardiness) and learn which plants are best for your growing conditions and climate. Invasive species (plants and animals) are huge problem these days and it is critical that gardeners are making safe choices that benefit the environment. Once you have Adobe Reader, click on the Add to Cart button, and follow the prompts on the screen. Growth rates vary greatly with each variety so check your seed packet for specific info. The key is warm soil temperatures for optimum seed germination. For cool-tolerant crops, in general, the seed sowing soil temperature range is 50 to 68 °F | 10 to 20° C.
Covers including cold frames, cloches, polytunnels, or frost cloths will help prevent damage from cold and frost. Mesclun Greens | 30-45 days – this is my favourite variety pack and often comes with 6-10 different seed types. Peas | 50-60 days | pea shoots are sweet and delicious! I have linked to examples of these seeds in Amazon so you can see them, but I strongly recommend finding a good, reliable, local seller for seeds proven to succeed in your climate and growing conditions. Plus, you can benefit from their experience and expertise. You can find a directory of garden plant and seed sellers for Canada and the United States here. Order your seeds right away to you have them right when needed. Timing is important. 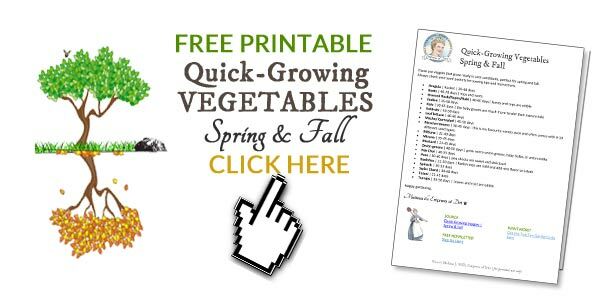 Read all of the seed packets for sowing tips. In fall, sow at least six weeks before first expected frost. In spring, sow as soon as soil temperature is favorable (this has more on soil temperatures). 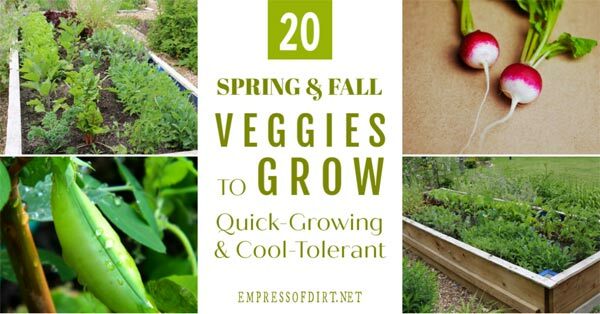 Cool-tolerant veggie seeds need temperatures of 50 to 68 °F | 10 to 20° C to germinate. Note any special sowing instructions (e.g. pea seeds can be pre-soaked in water to encourage germination). For continuous harvests, sow the fastest-growing crops every two weeks. Keep notes in your garden journal tracking sowing dates, conditions, best/worst crops, recommendations for next time, save seed packets, and take photos. If you love cool weather gardening, consider growing your veggies right through the winter. If you would like to save and print the checklist (below), or keep it on your device, use the Add to Cart button (below). 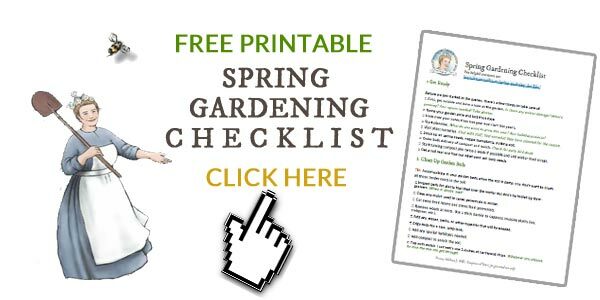 You can also read more about Spring Gardening Tips here. This free download is in PDF format and can be read on any device with Adobe Reader (free). Watch where the file saves on your device so you know where to find it. Thank you, do not have a beautiful garden like yours, but do not mind dirty hands from the planting the few flowers I have enjoyed.